I don’t usually like to have my own picture taken. Something seems to go wrong in every shot, and I look older and more out of shape than my own self-image leads me to believe. The one exception is when my son picks up his camera. He shoots with a Fisher Price instamatic. It’s an older model with a flash cube and a fixed focal length lens. The images appear in the viewfinder for instant review just like modern digitals… the difference being that it only has a four image memory, and the images can’t be deleted. 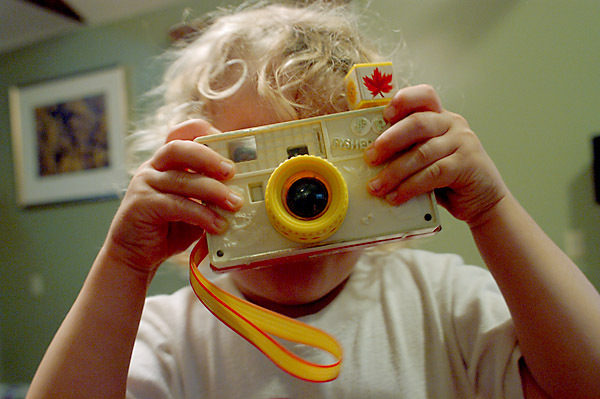 With the price of budget digital cameras being as low as they are, I really need to get him a real one. He likes to hide behind the camera, and avoid having his picture taken just like his daddy. Unlike his daddy, when someone gets a shot of him, he usually looks as cute as a button. I took this shot with a Nikon D100 at ISO 800, 1/8 sec – f/4 . The image is pretty sharp considering the shutter speed, although you can see some motion blur in his hair. The lens used is a Nikon 24mm f2.8 prime. I really like the lens alot. On a D100 it gives an angle of view similar to that of a 35mm lens on a film camera. It’s also a fairly small lens, which is the main reason it stays on my camera alot.